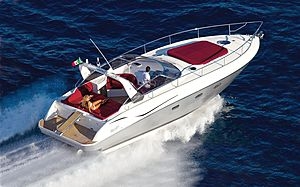 Express-cruisers are crafts measuring between 9,5 (31 feet) and 15 m (50 feet), and feature a closed deck. Open express-cruisers feature open cockpits and a closed front deck. They are equipped with amenities such as a kitchen, bunks, a shower, a toilet room, etc. An open express-cruisers is ideal for short trips. The cockpit being open, piloting can be uncomfortable during rain but is especially pleasant in warm weather. An open express-cruisers is usually propelled by an inboard motor with a stern-drive or a propeller shaft. The cockpit layout can include wide seating.